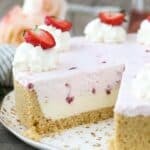 A layered no-bake mousse cake, this Strawberry Mousse Cake starts with a Golden Oreo crust, a layer of white chocolate mousse and a fresh strawberry whipped cream on top. We’re in the mid-summer heat wave here in Oregon and I hate having to turn on the oven unless I have to, but I still need to be able to prepare desserts. 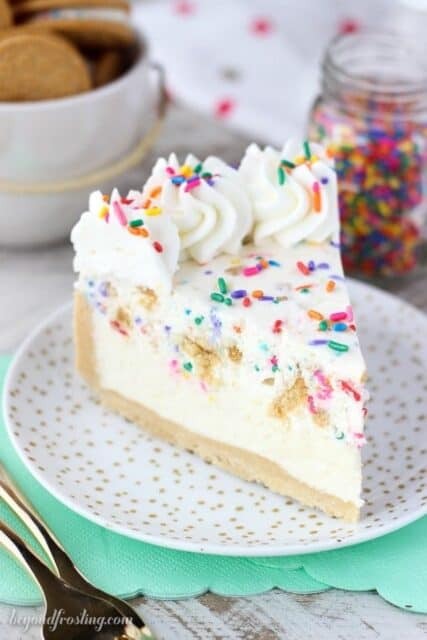 Thank goodness for no-bake desserts! They aren’t always the quickest recipes to make simply because you usually have to wait for them to set in the fridge, but it’s worth it! 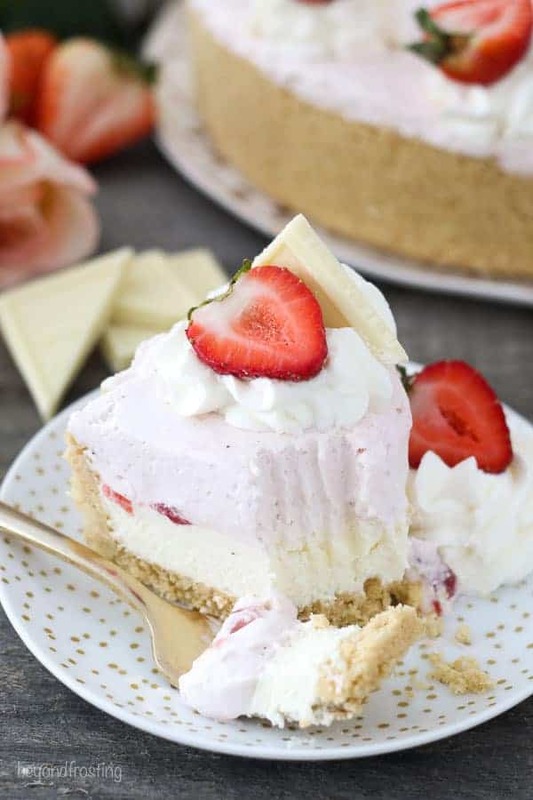 This No-Bake Strawberry Mousse Cake starts with a Golden Oreo crust, a layer of airy white chocolate mousse followed by some strawberry whipped cream on top. I seem to be churning out these mousse cakes non-stop, but it’s because I am just LOVING all the different flavor combinations! To make a mousse cake, you first need to decide on your crust, I prefer to use Oreos because they hold together the best. The filling of the Oreos acts as a binder for the crust. You could also use graham cracker, Nilla Wafers or any other type of cookie. 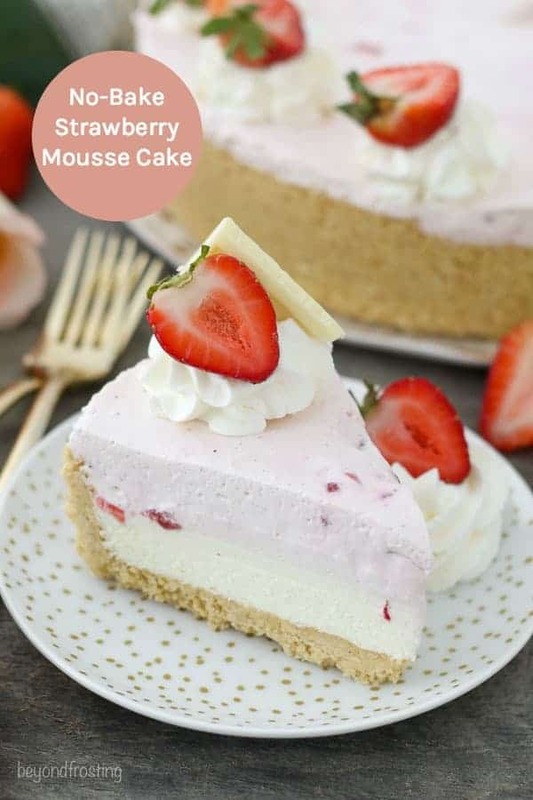 Then choose your flavor of mousse, usually chocolate or white chocolate. The mousse is simple to make but it takes a couple of steps to do. First, the chocolate is melted in the microwave. I recommend melting the chocolate at 50% power, so it doesn’t burn. I always suggest using a high-quality chocolate, and I tend to use chocolate bars instead of chocolate chips. Chocolate chips will work if you’re in a pinch, but they normally have a coating on them, and when melted, tend to be oilier. While the chocolate is cooling, prepare a batch of whipped cream and set it aside. Then, whip some cream cheese together with the melted chocolate. Once this is well mixed, fold in the whipped cream. It’s quite simple! Most of my mousse cakes call for gelatin. This helps stabilize the filling but also adds to the airy texture of the mousse. The gelatin is also way easier than you think! Simply pour the powdered gelatin over cold water and allow it to turn to a solid gel. Then microwave it for a few seconds and it turns back to a liquid. Then it’s usually combined with another liquid such as melted chocolate or whipped cream. 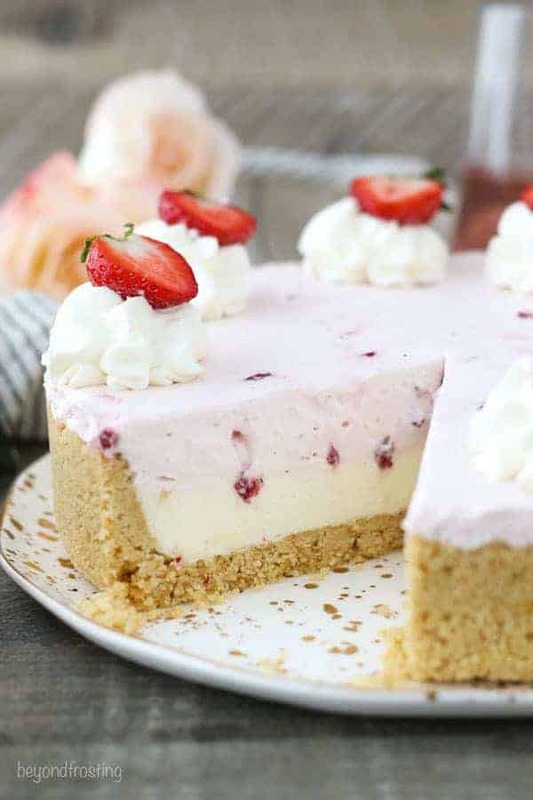 For the strawberry whipped cream, it’s basically a homemade whipped cream with gelatin and strawberry puree, plus some chopped strawberries for that pop of color. The strawberry whipped cream is very delicate. 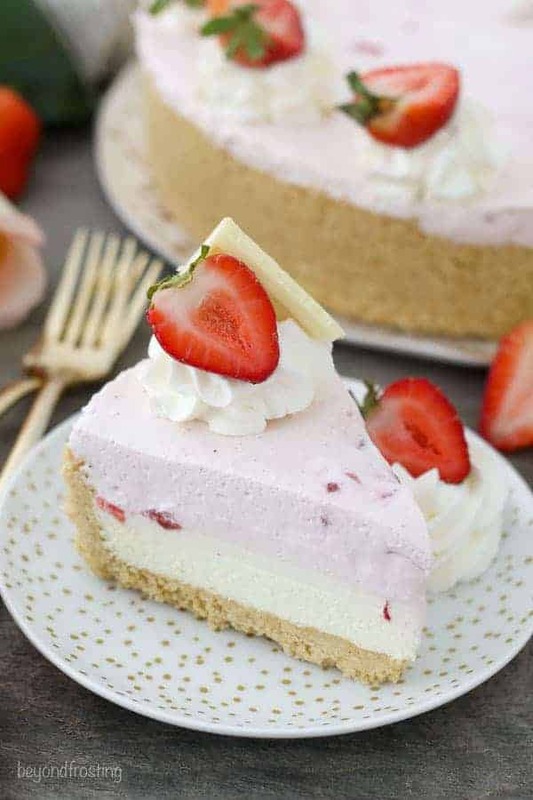 It’s not an overwhelming strawberry flavor, but it’s the perfect complement to the layer of white chocolate mousse below it. If you want a strong strawberry flavor, I might suggest adding a ½ teaspoon of strawberry extract. Anytime you’re introducing another liquid to the heavy whipping cream it tends to be less stable, but that is why there’s some gelatin in here. 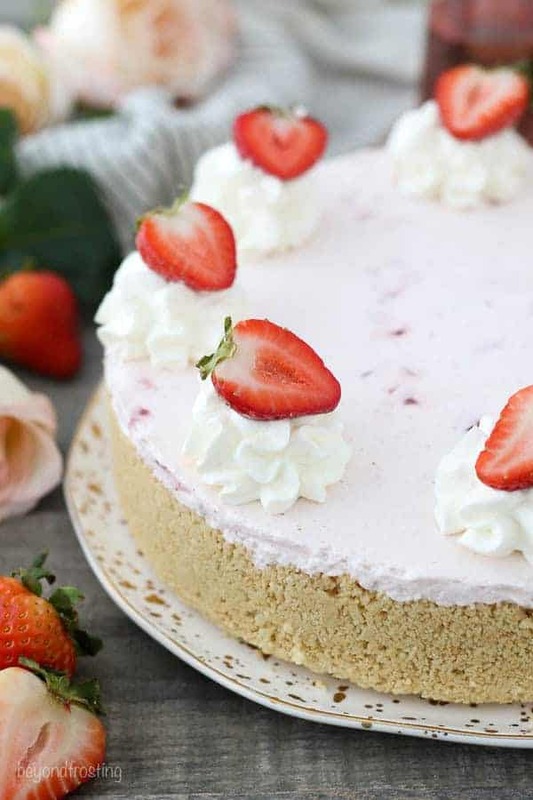 Once this Strawberry Mousse Cake has set in the refrigerator four a couple hours, it’s time to slice and eat. 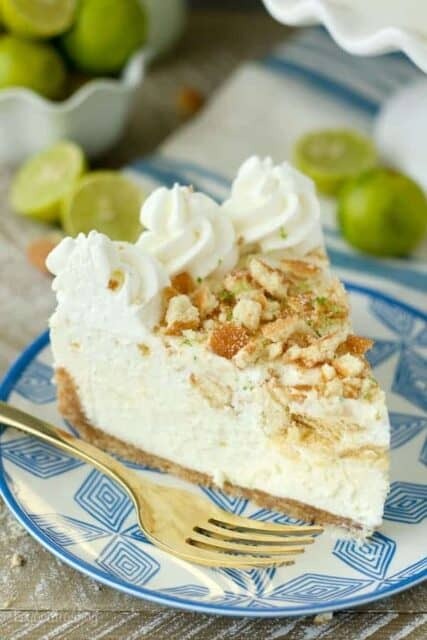 Each bite is as refreshing as the next. 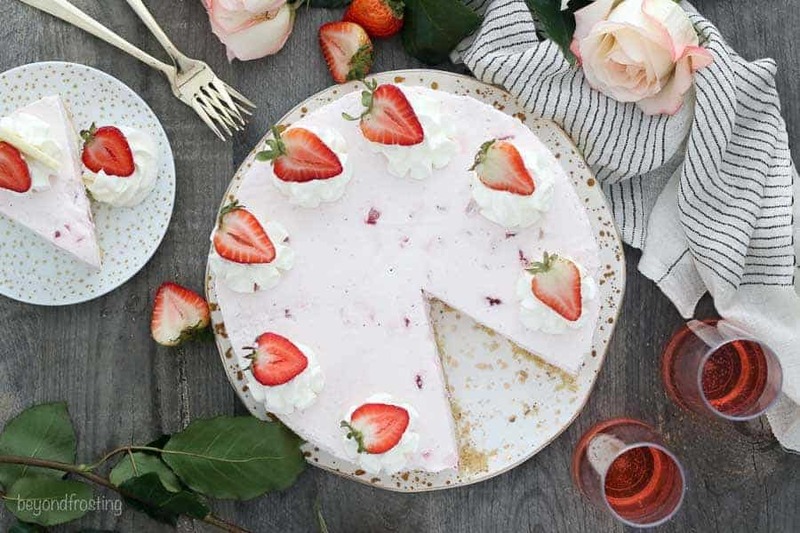 This No-Bake Strawberry Mousse Cake starts with a Golden Oreo crust, a layer of white chocolate mousse and a fresh strawberry whipped cream on top. For the chocolate mousse: Place the mixing bowl and whisk attachment in the freezer for 5 to 10 minutes to chill while you are preparing the next steps. In a microwave-safe bowl, microwave the white chocolate at 50% power in 30-second increments, stirring each time until the chocolate is melted. In a food processor or blender, puree 4 ounces of strawberries until it reaches a liquid consistency. Set aside. Dice another 4 ounces of strawberries into small pieces. Set aside. Slowly add the powdered sugar and gelatin and continue beating on high speed until stiff peaks start to form. Pour in the pureed strawberries and beat until well combined. Finally, fold in the diced strawberries and spread over the white chocolate layer. Refrigerate for 3-4 hours until set. For the topping: Prepare a small batch of whipped cream as instructed above. Pipe the boarders of the mousse cake using a large open star tip. Garnish with sliced strawberries. This dessert must stay refrigerated. Could I make and freeze this a few days ahead of time? Thanks! Hi Alison, I think that should be fine. 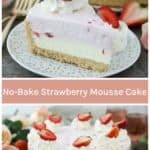 I don’t usually freeze these recipes, but I have done it with similar ones like cheesecake and it seems okay. It’s best to add the toppings before serving. Can this be made a day or two in advance? Or will the cookie layer go stale? Yes this can be made in advance. The cookie crust does not go stale, it’s like any Oreo cookie crust! I love no-backed desserts! I couldn’t stay the heat this summer days! The perfect layers in this cake are a dream!